Ventfort Hall, built by George and Sarah Morgan as their summer home, is an imposing Jacobean Revival mansion that typifies the Gilded Age in Lenox. Sarah, the sister of J. Pierpont Morgan, purchased the property in 1891, and hired Rotch & Tilden, prominent Boston architects, to design the house. And the Museum boasts a very unusual exhibit! An extraordinary exhibit the likes of which the Berkshires has never seen, featuring 59 stunningly beautiful miniature “fashion models” that portray the history of women’s fashion from 1855 to 1914. John R. Burbidge, retired Senior Designer of the famed Priscilla of Boston, began the painstaking work of creating his 29-inch tall “ladies” almost 30 years ago, and each is a masterwork. The outfits, exquisite in every detail, are all completely original designs by Burbidge, who after extensive historical research imagined himself working as a designer in a bygone era. The 1893 mansion provides the perfect backdrop for the exhibit of sixty, almost half-life size “Ladies” in their hand-made costumes, each a work of art. 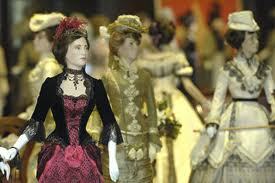 They portray the history of women’s fashion from 1855 to 1914 in exquisite detail. A very “enchanting” experience for all lovers of the Victorian era! They also host fun special events such as “Paris 1890 Unlaced”, “Victorian Tea & Talk”, ” Merry Nutcracker Ballet & Tea”, a ” Ghost Hunt”.